This is NOT a reservation. We require a deposit to lock in any reservations. Please wait for the Events Department to contact you via EMAIL with further information and the next steps to lock down your reservation/event. We do not accept same day reservations. Please WALK-IN if you are inquiring for TODAY. For reservation & event inquiries, please plan at least 3-4 days ahead when reserving and we will get back to you between the office hours of Mon-Fri 10am-6pm. The latest general lane reservations on Fridays and Saturdays are at 9:30PM. Specials DO NOT apply on holidays. 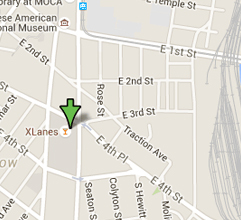 Please make sure your entire group arrives at XLANES FACILITY NO LATER THAN 10 MINUTES prior to your reserved time. You will have to go through security point for WEEKEND evening hours, so please allow sufficient time when arriving at night, especially on weekends. If your reservation falls on a WEEKEND NIGHT, and your group is NOT PRESENT when checking in or FAILS TO ARRIVE ON TIME, your group will be AUTOMATICALLY MOVED TO WAITING LIST. You will have 10 minutes once you are on the lanes to settle in, enter names, and start your games. Only hourly rate are available from 4:00PM til close both Friday and Saturday nights. We do not accept general lane reservations past 9:30PM on Friday and Saturday nights. We provide FREE PARKING VALIDATION up to 4 hours for our guests. Please ask for the EVENTS PARKING STAMP if you are attending a planned party event. Parking garage is available for you on the 4th floor or rooftop. Please take the bridge on the 4th floor into the building and turn left. Entrance to the parking garage is located on S. Alameda Street, between 3rd and 4th Street. Just a friendly reminder that NO OUTSIDE FOOD/BEVERAGE IS ALLOWED here at XLanes, including water bottles. Please remember to bring a GOVERMENT ISSUED ID with you. ID checks after 7PM Thursday - Sunday. You must have a valid ID to enter. ID's NOT PERMITTED: Expired ID's, temporary DMV papers, picture of ID/passport. Guests under 21 years old must be accompanied by parent or legal guardian 25 or older. PLEASE MAKE SURE ALL YOUR GUEST BRING THEIR VALID I.D. FOR ENTRY.